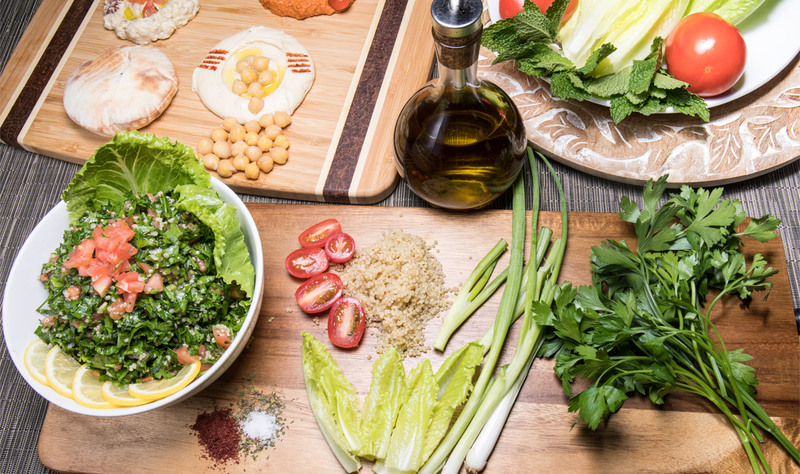 In Lebanon, salads are created to be bright on the eyes, light on the stomach, and high on the flavor. We also are fans of adding a little crunch to it as well. Since summer is almost here, summer salads need to be discussed. We decided to discuss the main attraction of all salads and that’s the “Tabouleh”. There has always been a debate between the fatoush and the tabouleh people. Some prefer both, while others choose only one. Both salads can be created differently. For example, we have recently added quinoa tabouleh to our menu. Tabbouleh, originally a Lebanese dish, it’s a major salad in the Middle East. Our process is hand chopping fresh parsley, fresh mint, tomatoes, green onions, then adding lemon juice and oil. The benefits of subbing quinoa for bulghur wheat is that it is gluten-free! So to people with gluten intolerance can enjoy this salad with no worries. The texture of the quinoa itself is more delicate than the bulghur wheat. It isn’t as heavy on the mouth or stomach. For the vegans out there, the protein content of quinoa is a great addition. Another plus to subbing in quinoa is how quick it can be cooked, which is in a matter of minutes! The fattouch salad is known for its sour taste. It is made to be very fresh and matches perfectly with heavier foods. We mentioned at the beginning of our blog how a little crunch can be added to the salad, and this is where the crunch comes in. Cooked bread (small pieces) are placed and mixed into the salad giving the perfect combination. Book a table here or stop by and try our new Quinoa Tabbouleh!